Administrative-Distance (hereinafter AD) is the value that determines a preference which route should be chosen if there are two or more routes which each has the same destination and different NextHop. Lower AD value takes precedence. Depending on routing protocol, whether static route, or OSPF, or RIP, or EIGRP, or also Redistribution route, the default value of AD has been determined. This value can be changed by settings. For example, consider the case of using the default AD value in the following NW configuration. 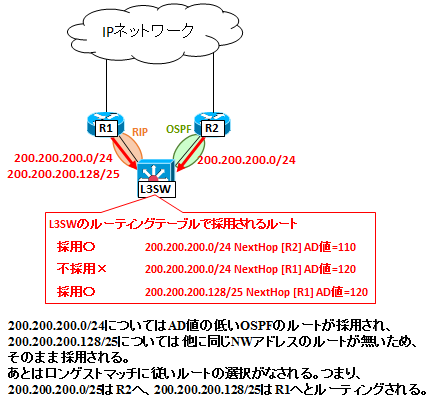 AD value of RIP whereas a 120, for AD value of OSPF is 110, will determine that OSPF has precedence if the same NW address. However, not exactly the same NW address, compared with a subnet mask is not the sole, is considered as a separate entry. So 200.200.200.128/25 without being compared to the 200.200.200.0/24, will be adopted what has been learned in the RIP is in the routing table. After the Longest Match will be made is routed according to. In other words, the Longest Match rule has precedence over the AD value. Here is an AD values ​​for each routing protocol below. It should be noted that, in OSPF and EIGRP, route to the Null on the router that the aggregate at the time of route summarization is automatically generated.This is to avoid a routing loop.Please refer here for details . Floating static is NW technique called which realizes the route redundancy using static route. It allows the route learned by dynamic routing protocols preferred to static route by setting the AD value of the static route to a higher value, means intentionally lower the priority. In case the distribution routes by dynamic routing protocols have failure, the router switch to static routes automatically. Specifically, it could be configured as follows. Point is, to deliberately set a static route, which is the original AD value = 1 to AD value = 130, and make RIP route preferred than static route. As a result, the normal time to use the RIP of the route, to bypass route is floating to R2 by a static route in the event of a failure of the R1, it is possible to ensure the redundancy of the route.